As a military intelligence analyst in the U.S. Army, I learned discipline at an early age. It takes a lot of discipline to manage money, so I’ve been able to apply this trait to my personal financial life. This means I closely watch what I spend, set aside a percentage for savings and charity, and live within my budget. Many people who have too much debt may not understand how they got into such a predicament. They may be eating at restaurants every weekend, spending money on new clothes, and buying nice gifts for birthdays and holidays because, well, that’s how they’ve always spent their money. Of course, it takes discipline to manage your money and to manage your debt. To become debt free and stay that way, you must understand the reasons you got into debt, then take action to avoid repeating this behavior. It sounds simple, right? It sure does. But think about the person who is 20, 30, or 40 pounds overweight. He knows he’s a little heavier than he would like and that it may not be healthy. Yet, he keeps making the same mistakes, such as eating too much, eating the wrong food groups, or not exercising enough, and therefore, he doesn’t lose any weight. It’s the same pattern of behavior that causes people to have trouble with money. Establish a priority spending plan to identify and prioritize your expenses. Determine items you really need, such as food and gasoline, versus items that you would like to have, such as new clothes or dining at restaurants. Saving $100 each month by saving on clothes or eating at home will enable you to find the money needed to pay down your debt. Evaluate your current spending habits by asking yourself some key questions: do you keep an organized list of things you need? Do you shop only when you realize you’re out of something, or do you purchase items on impulse? If you like to shop, try to build funds into your monthly budget—you’ll enjoy shopping more, and you’ll buy clothes or households items you really need. Plan ahead to ensure each dollar has a specific purpose. If you develop a monthly spending plan, and you want to purchase new clothes, but your spending plan only allows you to spend $58 each month on clothes, you will begin comparing prices, getting the best deals, and saving money. Once you’ve set your priority spending plan, you’re ready to tackle your credit card debt. There are several methods for paying unsecured debts. Depending on the method you choose, prioritize your debts in order of balance, interest rate, or both, and list details for each creditor. One method is to pay off one account at a time, starting at the top of the list. Once each account is paid off, add those extra dollars to the next account while continuing to make at least minimum payments on all other accounts. 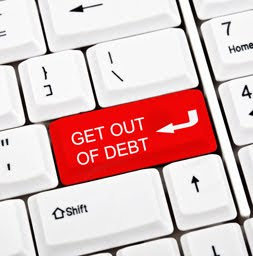 To learn more about various methods for paying down your debts, visit www.CredAbility.org/education and take our free online course called “Change Your Financial Fate.” Take a look at Equifax’s Debt Wise Program to learn additional strategies for paying off debt. Always track your daily spending to stay on target for achieving your financial goals, whether you have credit card debt or even after your debt has been paid off. To download our free pocket tracker, visit www.CredAbility.org.